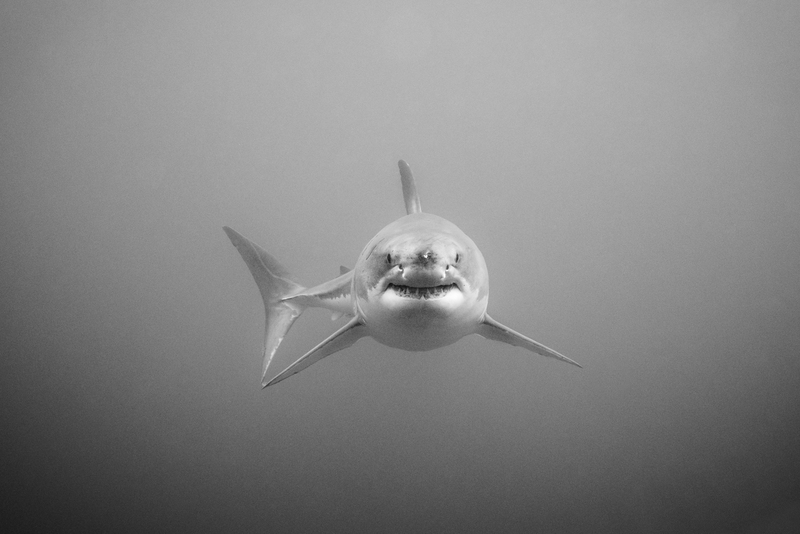 Face-to-Face with the Great Whites is an exhibition of fine-art photography and videos of Great White Sharks off the coasts of Australia and Mexico. The great white shark is the only known survivor of the prehistoric genus Carcharodon and one of the world’s apex predators. It is generally accepted that they grow to be 22 to 23 feet long, give birth to live young, and are found predominantly in temperate and tropical seas. Most active during the daytime, their preferred prey is marine mammals (including, seals, sea lions, elephant seals, dolphins) and fish (including other sharks and rays); however, they are highly adaptable and can shift their diet and habitats as needed. Although most people are aware of “Great Whites,” relatively little is actually known about them because of their scarcity and reclusive behavior. As a result, their total population is unknown and even local estimates are questionable; but they are being caught by fisherman in increasing numbers and there may be cause for concern for the species. A couple of short films will run during the exhibit to give viewers an idea of what it feels like to work inside the shark cages.